Probably the best OMRI approved product ever to fight aphids. A botanical insecticide, repellant, anti-feedant, and insect growth regulator. Use as a soil drench, foliar spray, or for hydroponic applications. Used to control insects on indoor and outdoor vegetables, ornamen-tals, trees, shrubs, and other plants. May be used up to the day of harvest. It pre-vents insect larvae from developing into adults. Insects will feed less or not at all on treated foliage, so they fail to mature and reproduce; ultimately starving to death. 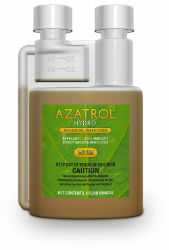 Plants will take Azatrol up into their tissue, and it will remain there for a few weeks in most cases. Spray at least once every 2 weeks, more if infestation is high. Works on aphids, fungus gnats, white-flies, caterpillars, spider mites, thrips, and the list goes on and on. Azadirachtin 1.2% (from the neem kernel). 1-4 tablespoons per gallon of water.